Cricketer-turned-politician Imran Khan’s 22-year-old dream to change the fate of Pakistan has finally come true as preliminary results from 82% vote count on Thursday showed that his party, PTI, is in a comfortable position to form governments in the Centre and at least three provinces, except Sindh. 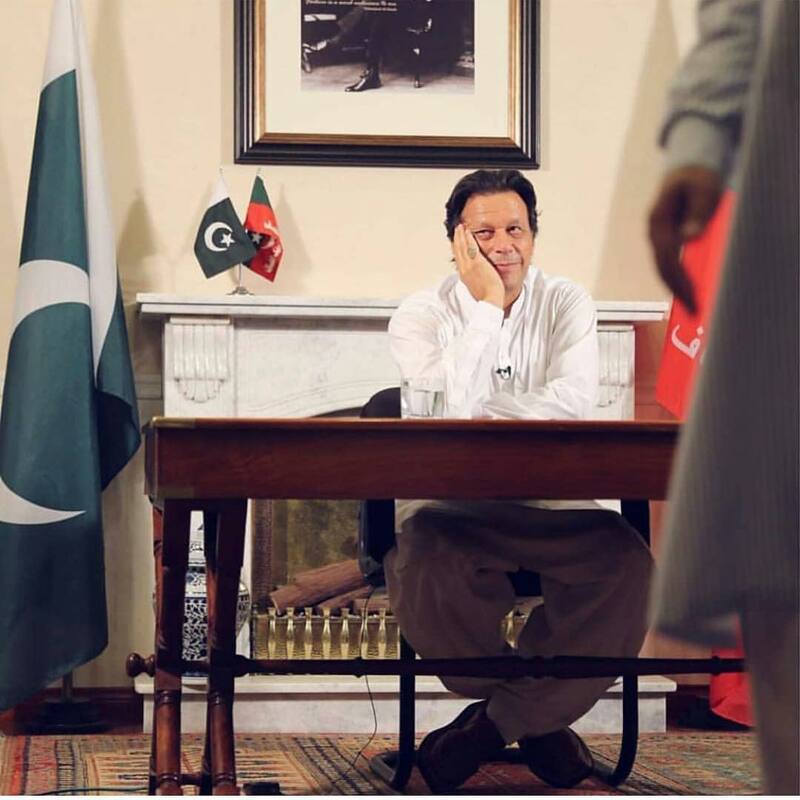 While the entire nation hopes that Imran Khan will walk his talk for a ‘Naya Pakistan’ despite giving up his ideology of not relying on ‘electables’ to come into power, several key issues ranging from a crippled economy, electricity outages, a worsening water crisis, and the fact that no prime minister has ever completed a full five-year term of office in Pakistan, however, will test his resolve and fortune. LAHORE: As the Pakistan Tehreek-e-Insaf (PTI) is well ahead in the General Election 2018, winning majority of the national and provincial seats and its main rival PML-N announcing that it will sit on the opposition benches, cricketer-turned-politician Imran Khan in his well-articulated ‘victory speech’ on Thursday pledged to safeguard the interests of ordinary citizens while promising not to resort to retaliatory measures against his political rivals. According to preliminary and unofficial results, PTI has managed to grab 119 general seats in the National Assembly, enough for it to form a government at the Centre without unwanted allies. Two major parties — Pakistan Muslim League-Nawaz (PML-N) and Pakistan People’s Party (PPP) – secured 63 and 43 seats in the Lower House respectively, according to 82 per cent vote count. For the first time in history, the PTI is set to form a government for the second time in Khyber Pakhtunkhwa (KP) where it has secured 65 seats out of 99, vindicating the party’s claim of carrying out development in the province during its previous tenure. In Punjab too, the PTI has promising numbers and may even form a government there. Soon after the election results started pouring in, almost all the major political parties including Pakistan Muslim League-Nawaz (PML-N) and Pakistan People’s Party (PPP) levelled allegations of rigging ‘behind closed doors’ after the polls and rejected the results. On Thursday, however, PML-N President Shehbaz Sharif announced that his party would sit in the opposition, allaying the PTI’s concerns that its main rival will boycott the election results and resort to street protests against alleged rigging. During his victory speech made at his Bani Gala residence that was broadcast via a video link, Imran Khan claimed victory and said that he was thankful to have finally been given the chance to implement the manifesto he dreamed up 22 years ago. He termed the general elections 2018 “historical”, saying that he had been finally given a chance to “change the fate of the country”. In his address, Imran promised a state which would take care of the underprivileged, with the new government’s policies focused on enabling the less fortunate prosper. “A country is not recognised by the lifestyle of the rich, but by the lifestyle of the poor,” he said while highlighting the issues common man faces in the country. “I want to share the kind of Pakistan I envision, the type of state that was established in Madina, where widows and the poor were taken care of,” he explained. Although he claimed to have “suffered the worst kind of personal attacks” that any political leader has had to sustain over the last three years, “this is all behind me now”. “All my policies will focus on strengthening the weak,” he emphasised, adding that his government will develop a tax culture that shows people that their money is being spent on them and not being stolen. “I pledge to safeguard the nation’s taxes. We will decrease all of our expenses,” he promised. “Our institutions will be stronger, everyone will be held accountable. First I will be subjected to accountability, then my ministers and so on. Today we are behind other countries because there is a separate system for those in power and a separate one for ordinary citizens,” he said. “We are facing governance and economic challenges. Our economy has never been so abysmal. It’s because institutions have not been doing their jobs,” he explained. “Our government will decide what we will do with PM House. I would be ashamed to live in such a large house. That house will be converted into an educational institution or something of the sort,” he said. “We will improve tax culture. People will pay taxes because they will see that their taxes are being spent on them. We will help farmers, the business community and help the youth to find jobs and develop their skills. Our money will be spent on human development,” he added. The PTI chief dismissed allegations of rigging made by some political parties and termed the polls “the fairest in Pakistan’s history”. He, however, promised his cooperation to investigate such allegations. “Speaking about rigging, I would like to say that neither was the election commission from PTI nor was the caretaker government made without the acceptance of any party. All of you opposed me when I asked only for four constituencies to be open. However, we will help you. We will open the constituencies you want for scrutiny,” he stated. Imran said that he also want to commend the armed forces. “Brave soldiers lost their lives during polling duty,” he said. “Since the United States (US) is involved in Afghanistan, we would want to have a mutually beneficial, balanced relationship with it as well,” he observed. “Saudi Arabia is a friend that stands with Pakistan in the hour of need every time. We hope to maintain that,” he stated. “I am hopeful that we can sit at the table and get done with the issue of Kashmir once and for all. If India takes one step towards us we will take two steps,” the PTI chairman assured. He also said that Pakistan can learn from China regarding “how they curbed corruption”. The PTI leader once again reiterated his plans for the nation saying that the government and people together can fix the governance system, transforming it into one that produces the opportunity to invest in Pakistan. “I pledge to my fellow citizens that you will see new governance from now on. I will make Pakistan a country where instead of policies for the elite, policies for the lower and working class are shaped. For those who labour in houses of the rich and for those who can’t send their children to schools,” vowed Imran. “I pledge that all my efforts would be to adopt simplicity. Please pray that Allah gives me the strength to fulfil all promises I have made to you. I am thankful to you all,” he concluded. Among the challenges facing the new government, the immediate priority has to be to correct imbalances. A full-year current-account deficit of 5.7 per cent of GDP isn’t exactly a shallow hole, and there’s no guarantee that an 18 per cent drop in the rupee in the past year will do much to fill it. From December 2017 till the middle of July this year, the rupee has been devalued in four rounds by the State Bank of Pakistan by around 21 per cent to stimulate exports, which grew by around 14 per cent to $23.228 billion in recently concluded FY18. The Pakistani rupee’s near-18 per cent slump puts it among the 11 worst-performing currencies that have slumped 10 per cent or more over the past year. And foreign exchange reserves plunged to a four-year low and as of July 13, central bank reserves were recorded at $9,063.6 million. However, correspondingly imports skyrocketed to a record high of $60.898 billion, growing 15.10 per cent and contributing to the trade deficit reaching $37.670 billion in FY18. The economic mismanagement of the previous government, rising external and domestic debt, the balance of payments problem challenges will create a lot of headaches for PTI. Although, the economy grew at 5.8 per cent during FY18, the highest in a decade but Fitch in its advisory earlier this month warned that after general elections, the next government would have limited time address its debt problems which are bound to accelerate in 2019, hence, requiring concentrated policy efforts and swift implementation starting this fiscal year. Talking to Pakistan Today, Pak Kuwait Investment Co AVP Research Adnan Sheikh highlighted the challenges PTI government is likely to face when it comes into power. Interestingly, when PTI comes into power, it will be severely restricted on the policy and financial front, an immediate visit to the IMF for a bailout cannot be ruled out and the global trend of rising interest rates and increasing oil prices either wouldn’t ameliorate its cause. Official estimates show that by 2025 the country will be facing an “absolute scarcity” of water, with less than 500 cubic metres available per person — just one-third of the water available in parched Somalia, according to the UN. Pakistan has massive Himalayan glaciers, rivers, monsoon rains and floods, but just three major water storage basins, compared with more than a thousand in South Africa or Canada. Similarly, shortage of dams is depriving the country of low-cost electricity and a viable alternative to coal-based power production. Despite being on the cards, the construction of dams has hit rock bottom due to political machinations in and out of the parliament. The boom is negating hard-won economic and social progress in the developing country, experts have warned. To add to the problem, discussing contraception in public is taboo in Pakistan. The upcoming government would have to formulate long-term policies to address the population boom and issues correlated to population issues like housing. Among other pressing issues, Imran would have to address terrorism financing especially in the context of Financial Action Task Force (FATF) which put Pakistan on its grey-list. The caretaker government recently missed a deadline to address the concerns raised by the forum. The PTI government would have to struggle to keep Pakistan off the ‘black-list’ or the country will face worst sanctions which can overshadow economic gains made by the new government. The new government’s litmus test is going to be how it deals with the extremist outfits which pose a threat to the national security. In 2013, Imran attracted controversy for describing top Tehreek-e-Taliban Pakistan (TTP) commander Waliur Rehman as ‘pro-peace’ when he was killed by US forces in 2013. He has advocated for opening a Taliban office in Pakistan, arguing that if the US could open offices for the Afghan Taliban in Qatar, why couldn’t the Pakistani Taliban do the same? Similarly, he termed the killing of Taliban leader Hakimullah Mehsud by the US in a drone strike “deliberate targeting of peace process”. In February 2014, TTP nominated him to represent them in mediation talks. While Imran eventually refused, the incident showed the faith the Taliban had in him. Similarly, the PTI government in Khyber Pakhtunkhwa (KP) gave a grant worth PKR 550 million to madrasas of Samiul Haq. Ahead of the polls, PTI joined hands with Maulana Fazlur Rehman Khalil, who is on the US terror watch list.